So it’s just been a few hours after watching The Hundred Foot Journey. And well let’s take this a dish at a time. Beware of spoilers ahead. So if you’ve read the above information from IMDB and Rotten Tomato you’ll know that this is the sort of feel good movie with a quaint little story set in a beautiful place with food sort of being the main plot mover. And it being directed by Lasse Hallström who also directed Chocolat you wouldn’t be too far off. It’s still set in a small little village in France with cobble stone streets and meandering pathways. It does have a transplanted family looking for a fresh start in new surroundings. And of course it does have food. But that’s it. The movie opens with a little backstory. It’s back in India and you’re in a market. Hassan is being dragged through the hustle and bustle chasing after a man with a fresh basket of the mornings catch. They finally reach the stall that the man is heading for and everyone is clamoring to get their hands on what’s in the basket. It’s full of huge sea urchins. Famous for their flavor around the world. The seller can’t decide who to sell it to until he notices Hassan take one and has a taste of the roe inside. The expression on his face tells him, this boy knows how to appreciate it the most. So he sells it to Hassan. Here’s my gripe. Why are the characters in this scene talking in English? I know this is nitpicking but you’ll understand why as you read on. Also you’ll notice that the crowd gawps at the camera as Hassan and his mother walk through them. You’d think that the director would do a better job at getting them to act natural. Then you’ll be taken to a few years later when Hassan is his mother’s apprentice in the kitchen of the restaurant that the family runs. It’s a pretty nice scene, it’s full of life and it seems authentic. Then suddenly there’s a riot outside and people are scrambling to escape. They mention about some political thing that’s taken place and people aren’t happy. Not too sure what that has to do with a restaurant, unless of course the Kadams have profited immensely from one side or the other. So the restaurant gets overrun by the rioters and gets torched. Hassan’s mother unfortunately perishes in the flames. So they flee to London to find refuge. All this is told while Hassan is being interviewed by the immigration officer at an airport somewhere in Europe. I think it was Rotterdam. I’ve never in my life been held at an immigrations counter long enough to tell even a short story or even be interviewed so thoroughly while there but i guess this is a different situation. Oh, and when the officer asks him for his qualifications as a chef he tries to bribe him with samosas. So Hassan tells him that they were in London for a while and tried to establish their restaurant there. Hassan hones his skills at home which apparently is situated very near Heathrow. Apparently so near Heathrow that when planes fly overhead the backwash from the jet’s engine can blow off the tarp roof off a badly assembled canopy tent. I find that hard to believe for some reason. Ok, so they’re in London a few years but find the produce not up to their standards. It lacks soul. So pack up they do to find produce with soul. And this is where you pick them up next in France as they drive towards Saint-Antonin-Noble-Val. It’s lovely to be sure. Nestled in a valley with a river running right through it. It’s the picture book idea of what most people have of France and it’s many little quaint villages and towns. I think. So their van breaks down and they meet Marguerite. The sous chef at Saule Pleure. She gives them a hand at getting the van back to town and invites them home for a rest and offers them something to eat. The Kadams first introduction apparently to provincial french cuisine. Makes you wonder what they’ve been eating while they’ve been travelling through France. Throughout all this you experience the Kadams and how they relate to each other. It’s sort of spot on i guess, its familiar especially for us Asians. The way they interrupt each other. The way they speak. Their comments. But for whatever reason you don’t really sense the closeness that they should have as a family. It’s more like a family that went through a feud and is reluctantly going through this together as opposed to a family that’s gone through what they’ve gone through and looking for a fresh start. Or maybe I just missed something. Well whatever it was I didn’t feel it. It all felt sort of cold, distant. Also I’m not too sure but the Kadams seem to be dressed still like refugees and not only that but refugees from the 80’s to me. I thought they’d been living in London for a year at least? A year in London while running a restaurant and still they dress in ill fitting clothes from a second hand store. I know us Asians can be thrifty but this is a tad too ridiculous. And maybe a little racist? So as they’re taken through the town on a tow, Papa Kadam spots an abandoned old restaurant. The next day bright and early, Papa Kadam goes to have a look at the place with Hassan following close behind. As the both of them are looking through the place Madam Mallory interrupts them. Up till this point the story and the acting is unremarkable. But then Helen Mirren shows up and it gets better. Her performance is the one that makes the scene. She’s brilliant. So as expected they buy the place and turn it into a restaurant. Madam Mallory is not happy. Also you’ll notice that Papa Kadam suddenly has moments where he speaks in Hindi. Now, he speaks in Hindi. What happened when they were back in India? Also the Mayor of this little French village has a less pronounced french accent that Madam Mallory. This, for some reason, doesn’t make sense to me. So the first night of their restaurant the Maison Mumbai is pretty dysmal until Papa Kadam has a spark of inspiration. He decides to dress in a flashy traditional indian outfit complete with turban. In gold. 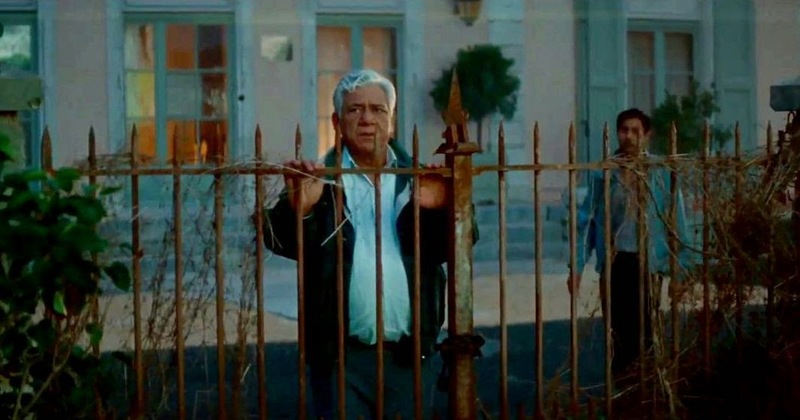 So he stands outside and waits for people to pass by, pulling in one couple by kidnapping their dog and distracting a bicyclist by having his pretty daughter smile at him. The funny thing is is that both restaurants seem to be situated a little bit out of town. You see it in a lot of wide shots where only the two restaurants are seen facing each other with one road passing in front. The rest of the village is seen off in the distance. So to believe that people would be wandering around at dinner time for the heck of it seems odd. Again I’m nitpicking. Madam Mallory is of course unhappy with the increasing activity that is seen and heard in Maison Mumbai. The Kadams have their music so loud that she can hear it from inside her own establishment. Which is another thing I found a little off with this movie. The music. It seems a little intrusive at times. And a little loud. Maybe it’s the cinema or something. But to me it didn’t seem to complement what I saw on screen much. So now you’ve got the basics. This is the main point of the movie. The Kadams against Madam Mallory. You go through a few scenes where they pick on each other. And you see Hassan try to be the peacemaker. 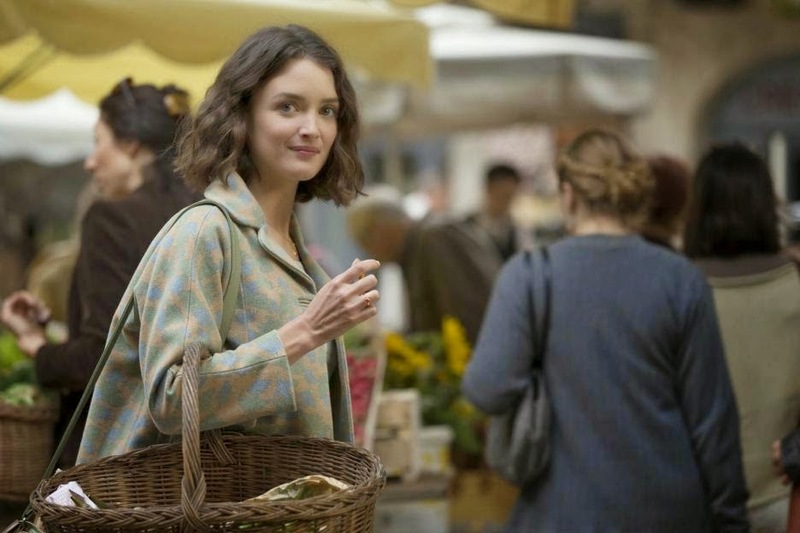 His genuine love for food makes him curious about the regions cuisine and he enlists the help of Marguerite who gives him books and pointers on French food preparation and what Madam Mallory is like as a boss. Seeing as how Madam Mallory seems to be the key to fully appreciating French haute cuisine he sets out to learn more and impress her. And impress her he does when he cooks for her and she offers him a place in her kitchen for a year. He grows of course under her tutellage and in fact gets so good he helps her get another Michelin Star for her restaurant. Marguerite who’s been there for years is not happy. 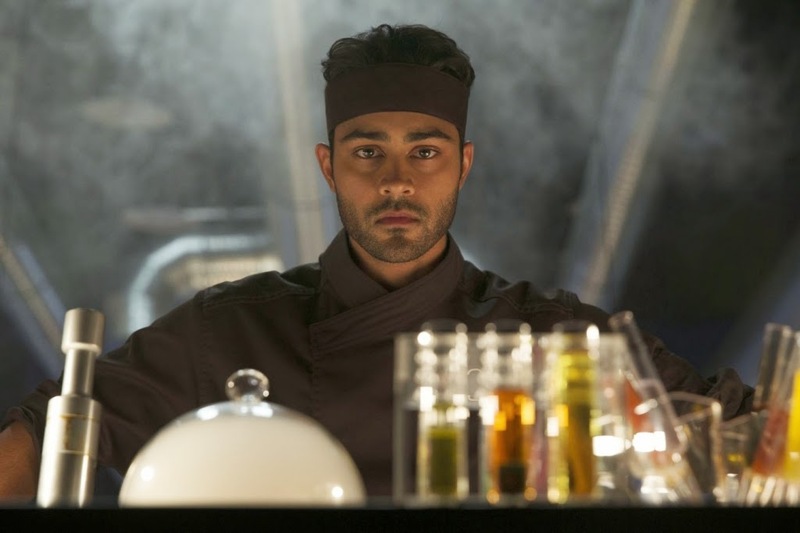 So now Hassan’s famous and gets offered to work in Paris where he ends up in an artsy looking restaurant doing Heston Blumenthal and Ferran Adrià style offerings. And he becomes the darling of the gourmet world. Papa Kadam and Madam Mallory of course learn to get along while Hassan’s away. It’s all very expected and predictable. Of course with movies like this you know he’s not going to be satisfied with all the fame and success and wants to find something more meaningful. They all do. So surprise, surprise on the eve of the Michelin Guide’s announcement of whether he gets another star, he goes back to Saint-Antonin-Noble-Val, where he cooks up something special, lays out a plan to Madam Mallory and Marguerite and surprises his family. That’s it. 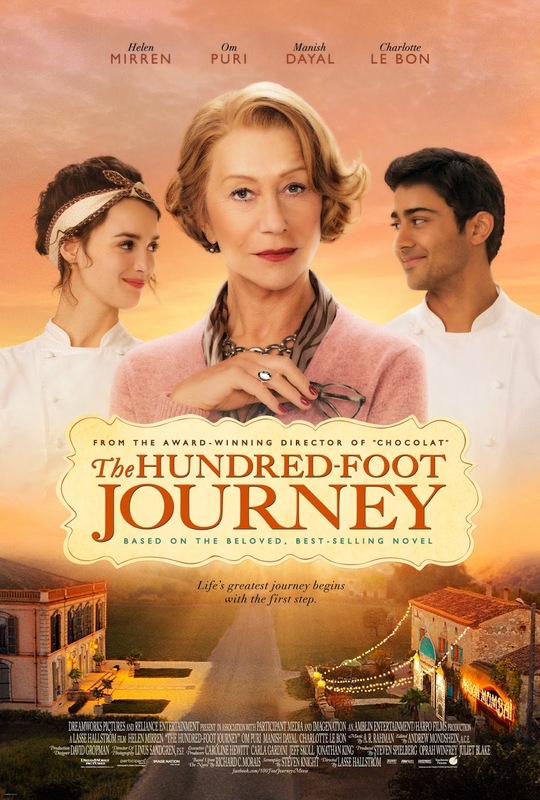 That’s what I remember and what I think of The Hundred Foot Journey. I’m sure from reading through all that you’ll get the feeling that I wasn’t impressed. Maybe even that I didn’t enjoy it. Well, yeah, I wasn’t impressed. The only thing that impressed me was Helen Mirren’s performance. Everything else was sort of okay. It wasn’t bad, it was okay. Which makes it sort of sad actually. I was expecting something close to Chocolat, maybe i was expecting too much. After all it is directed by the same man and looking at the list of producers which include Steven Spielberg and Oprah Winfrey you sort of expect it to be amazing. But it isn’t. You go away thinking that was an okay movie. You don’t walk away awed or inspired. Maybe it was all a little too predictable. Or maybe I wasn’t it the right mood or the right frame of mind. There are funny moments, some of the scenes and the visuals are beautiful and the dramatic scenes with Madam Mallory are pretty good but overall it just doesn’t satisfy, it’s not a meal to remember. It has all the ingredients to be good though. The quirky characters, the conflict between them, the beautiful setting, the clash of cultures and styles and all under the hands of a director that’s done something similar before. But I walked away from it being only mildly satisfied. Maybe it’s because I was nitpicking too much or maybe because to me it feels like the story seems rushed. The story after all takes place over a span of several years and you only see snippets of it. Or maybe I wasn’t drawn into the characters. Or maybe it’s all just too predictable, too formulaic. Who knows? Anyway to summarise, this movie is okay. I’m not too sure I’d recommend this movie enthusiastically to anyone but i wouldn’t say avoid it either. It’s not mediocre either. It’s just unsatisfying to me. Like going to a fancy restaurant that everyone raves about, that everyone says has beautiful ambiance and excellent food and building up this image, this idea of it only to be let down by it. So my advice to you. Ignore what you’ve just read. Don’t look up Chocolat and try to compare it. Don’t go in to it with any expectations. Don’t do what i did. Build a picture, an idea that’s too lofty. It’ll ruin the movie. Or maybe just go buy the book. Mille fois merci, to NUFFNANG for picking us among all the other brilliant entries to watch The Hundred-Foot Journey. And Shukriyaa Bahut Dhanyavaad to GSC at Paradigm Mall for having us bloggers for this preview screening. I love watching movies in your new cinemas. Very comfortable.